I met Zeph when she was four months old. 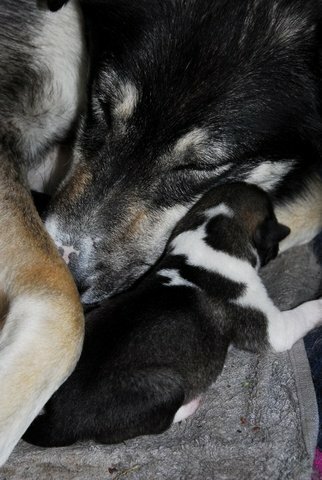 While most of the dogs were not yet at our winter location, Lil’ Bear and Zephyr arrived early. There were two pens with four puppies each in them, most being Zephyr’s siblings. I put her in the first pen, but all the other pups banded together and started bullying her. She was pretty good at defending herself, but even after several minutes and my attempts and getting them all to play, they still were after her. I moved her to the second pen, and the same thing happened- the ‘everyone gang up on the new girl’ mentality was clear. I took her out of that pen, and not really knowing what to do, decided to take her home for the night. It was a most joyous eve, settling in to a new place with this little spunky puppy whom I just met. She was so full of happy and curiosity and life; I knew we were destined to be best pals. She came home with me most evenings until she upgraded to the adult dog yard with her very own dog house. Her house was conveniently located right in line with my walking path home, so we got into a nightly routine: letting her off her tether, running around the apartment complex a few times, flying up the stairs, waiting excitedly for me to let her in, and barreling inside for fun and love. This pattern held true for a handful of regulars who joined me for nightly snuggles, but the others would take turns. Zephyr was constant. If I didn’t bring her in for a night or more to give others their space, she would whine and howl and make sure I knew I was forgetting her. 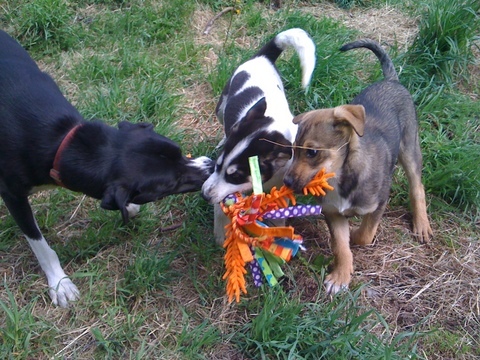 The adult dogs didn’t always get along with her- she was rambunctious and always wanted to play. She would storm in and lick any dog that was joining us all over the face, whether they liked it or not. “Kill them with kisses!” I would laugh, as she would continuously lick them on the lips- they did NOT like that! They would growl at her and give her looks, but she would mercilessly continue giving them all sorts of love. And so our love affair blossomed that winter. Though I wasn’t training her myself (she was running with the Pup Squad all season), our bond was obvious. And she was doing awesome! Reports were that she was becoming a great little leader and did very well in any position with most of the team. My heart was booming with pride. The following winter (2017-18) she was a yearling, and incorporated into the adult training program. I spent every day with and amongst the team, including Zephyr. She still spent most nights with me, but I was watchful of making her too spoiled. After training runs I would let her off the line, and she would run to the house, harness still on, waiting to be let in. Was I training her, or she training me?! She sat out of my one mid-distance race of the year due to mild soreness, but was ready for go-time come Iditarod. And Zephyr was a little all-star, as I knew she would be. There was a time on our last run that I felt like our race was close to its end. I knew we were trailing and had been warned. It was a gorgeous but too warm day- bluebird skies and sun shining brightly as we trekked our way to Unalakleet. I thought I was miles behind the next musher (though I found out later I was actually ahead! ), and had a moment on the trail with the dogs, thanking them for getting us this far. We all were feeling sluggish with the sun, but Zephyr suddenly wiggled her body with excitement. I had her in team, but she clearly wanted to be up front, so I put her in lead. It was truly a magical moment, as she gave it her all, rallying the team forward. I was beyond myself with emotion and pride. Little Zephyr honey knew, we all could feel it, and by golly we weren’t going down without a fight. It was one of those incredible ‘mom’ moments, absolutely beaming with pride at my team, my girl (assuming that’s what it feels like if you’re a mom!). We knew each other so well, day and night both training and having fun; she could feel my sadness, and in true Zephyr fashion, made everything a bit brighter. Where would we be without him?! 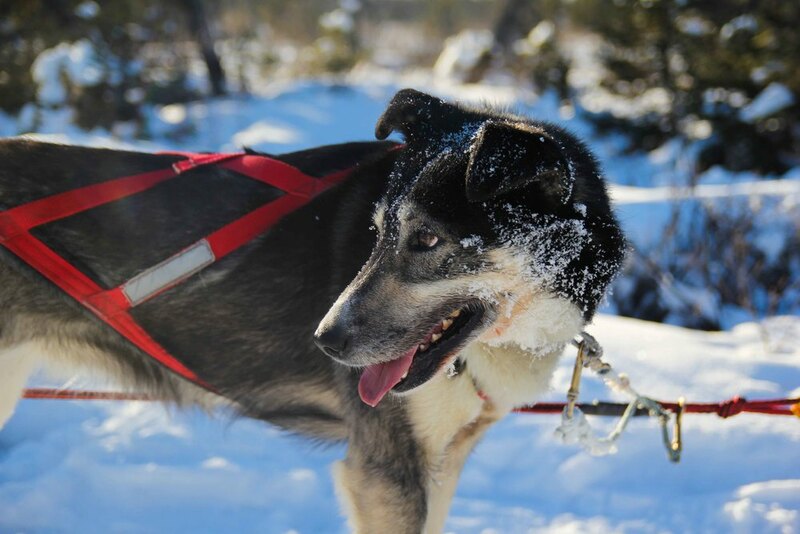 Felon has raced in lead and finished every race we have participated in: Aurora 50/50, Alaska Excursions 120, Knik 200, Copper Basin 300, Northern Lights 300, Kusko 300, T200 and Kobuk 440… as well as Iditarod 2016 & 2107. After Iditarod 2017, he retired at the age of nearly 10 years old. In January 2015, he finished 3x300 mile races in 3 weekends with us: Copper Basin 300, Kusko 300, Northern Lights 300. He's simply an amazing athlete. And, he loves human affection. I just love this quirky boy! Felon was born in Denali, AK at Husky Homestead (Berkeley x Solomon) , and is part of the Crimes & Misdemeanors litter. This litter was originally split between Jeff King and Jake Berkowitz. I bought Felon from Jake in the fall of 2012. I had a fantastic opportunity to run the Kobuk 440 in the spring of 2015 with Felon, Menace, Suspect and Burglar all in my team! Menace, Suspect and Burglar were then residing at Husky Homestead. Felon continues to live at Bacon’s Acres. He’s a great cheerleader for the team, and enjoys going on <10 mile runs with young dogs. Because of Felon’s great attitude and effort, he was chosen to father a litter of our pups. He’s the father of Tricky Mini, Molly, Paunch and Mr. Paws. And, he’s the grandfather of Fairy, Pixie and Troll. These are many of our current leaders for our team. Tricky argued he should have been the FIRST dog to be introduced because he was the FIRST dog in my Alaska life... the dog that helped lead my life in a new direction. Tricky was one of four puppies born March 9, 2009 in Girdwood. It was the first litter of puppies I ever held. From the time he was very young, he stared directly in my eyes. I took that to mean, "he picked me". When he was about 11 months old, I received a phone call saying the kennel was getting rid of "my" puppy. I drove down and picked up my puppy immediately. He was thin, stunk and had never been in a house. He refused to pass through doorways or walk up the stairs, so I carried him up the stairs and straight into the shower. I learned quickly, if we were going to be good buddies, it would require daily exercise (otherwise, he paced around the house... click, click, click, click, click). The day after I brought him home, I bought him a wooden dog house and a tie out. 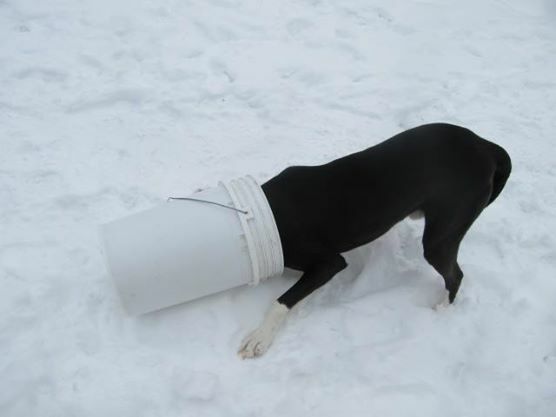 Don't all sled dogs sleep outside in dog houses? Well, he stood next to his dog house and stared at the house for hours. Of course, I gave in... His dog house sign, "TRICKY", will forever live above our cabin door. Tricky hopes to train sufficiently to participate in the Ceremonial Start of Iditarod 2016, but requests to be left home on the couch for the remainder of the event. 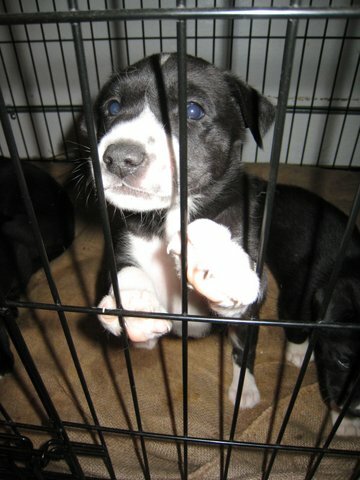 Libby originally named Liberty because she was born on July 4th, 2009 at Ryan Redington's kennel. She is the most exhuberent dog in the kennel. Always happy, loves attention and gets along with everyone. Libby's "friendliness" found her bred earlier than planned. Fortunately, this surprise breeding had amazing results. 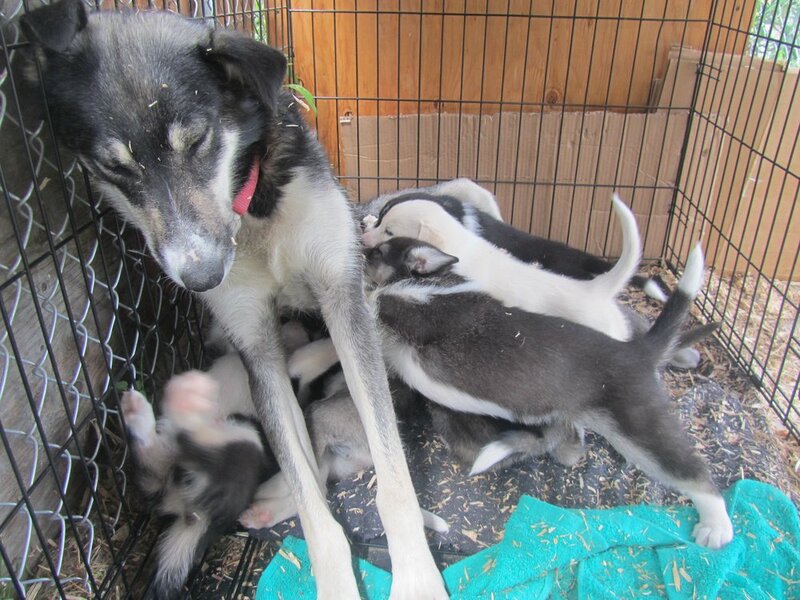 Libby x Felix (also Ryan's dog at that time) created an amazing litter of 8 beautiful, healthy, hard-working sled dogs. All 8 are training with the race team. While taking a break out on the trail, Libby's distinctive hollar alerts everyone it's time to move on. Once you meet her, you'll understand why Libby's requests are hard to ignore.